Educate a wide variety of stakeholders about the proper disposal of personal care products to help reduce unwanted chemicals in the Great Lakes system. “New York Sea Grant Extension is pleased to partner with our Sea Grant colleagues, educational institutions, the National Geographic Society and others who share an interest in the Great Lakes to pursue critical research and educational opportunities in 2013 on behalf of the Great Lakes’ unique environmental system,” said New York Sea Grant Associate Director and Cornell Cooperative Extension Assistant Director Dr. Katherine E. Bunting-Howarth. 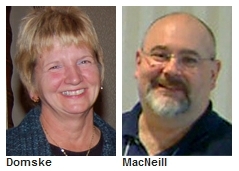 MacNeill and Domske were both recently honored with awards of excellence by the Great Lakes Sea Grant Extension Network.